U.S. Secretary of State John Kerry speaks during a news conference following a meeting with foreign ministers of the Gulf Cooperation Council (GCC) in Doha, Qatar Aug. 3, 2015. U.S. Secretary of State John Kerry says Gulf Cooperation Council foreign ministers have agreed that, once fully implemented, the Iran nuclear deal will contribute to their region’s security. Kerry commented on Monday following talks with Gulf ministers in Doha on the Iran nuclear deal and other issues. The talks were held with foreign ministers from Saudi Arabia, Bahrain, Kuwait, Qatar, Oman and the United Arab Emirates and followed a summit U.S. President Barack Obama held with representatives of those nations in May. Kerry said he and Gulf ministers agreed to establish working groups that would seek to expand regional security through cooperation on issues including intelligence sharing, special forces training and maritime security. U.S. Secretary of State John Kerry (C) listens while Oman's Foreign Minister Yusuf bin Alawi (L) speaks during a meeting of foreign ministers of the Gulf Cooperation Council (GCC) in Doha Aug. 3, 2015. In a joint appearance with Kerry, Qatari Foreign Minister Khaled al-Attiya offered a cautious endorsement of the Iran nuclear agreement, known as the Joint Comprehensive Plan of Action. He said the deal was best option among options. Avoiding nuclear weapons threats to the region is a top priority to the six GCC countries, said the Qatari foreign minister said. 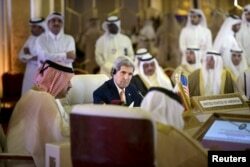 The GCC hopes to achieve security, peace and stability with the help of the United States, he said. Kerry sought to ease concerns about last month's multinational agreement on Iran's nuclear program. Some GCC members have questioned if the deal, which could result in an empowered Iran, would be destabilizing to the region. They also question if Iran would use the additional revenue that would result from lifting of international sanctions to provide more funding to militant groups such as Hezbollah. The two sides discussed other regional issues, including Libya’s unrest as well as unrest caused by Islamic State militants in Syria and Iraq. “There is no shortage of urgent and complex challenges that are facing the United States, Qatar and the Gulf states today,” Kerry said. 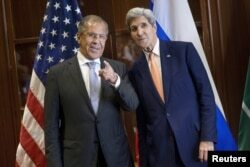 Russia's Foreign Minister Sergey Lavrov (L) and U.S. Secretary of State John Kerry talk before a trilateral meeting in Doha, Qatar Aug. 3, 2015. The peace process between Israel and the Palestinians is also a GCC concern. He urged the United States to “exert more effort” to get the peace process back on track. On the sidelines of Monday's GCC meeting, Kerry and Saudi Foreign Minister Adel al Jubeir met with Russian Foreign Minister Sergei Lavrov for what a senior State Department official said included discussion of the ongoing crisis in Syria. Kerry arrived in Doha, late Sunday, after spending the most of the day in Egypt in a strategic dialogue session with Foreign Minister Sameh Shoukry that focused on security and other issues. He is on a five-nation tour of the Middle East and South Asia. From Qatar, Kerry travels to Singapore, Malaysia and Vietnam, three countries that have been involved in talks on the proposed Trans Pacific Partnership to cut tariffs and trade barriers. He will also attend a forum in Kuala Lumpur organized by ASEAN, the Association of Southeast Asian Nations. While in Hanoi, Kerry will take part in an event marking the 20th anniversary of the establishment of diplomatic relations between the United States and Vietnam following the lengthy U.S. war there four decades ago.